To keep a full ice bin, change your ice maker if it is no longer making ice! 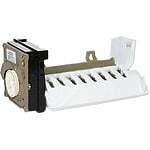 The Whirlpool FSP 2198597 Icemaker assembly is a genuine Whirlpool part that fits 25-27 cubic feet, side by side refrigerators with vertical ice dispensers in the freezer door. The icemaker fits Whirlpool, KitchenAid and Kenmore refrigerators. 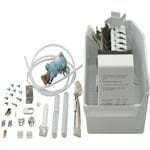 The Whirlpool 1129313 Automatic Icemaker Kit is a genuine Whirlpool part that fits all Whirlpool, KitchenAid and Roper porcelain lined refrigerators with 30", 33" and 36" wide cabinets. In Stock! Ships in 48 to 49 business days.